One of the main duties of a godparent in our Catholic faith is to be a living example of that faith. 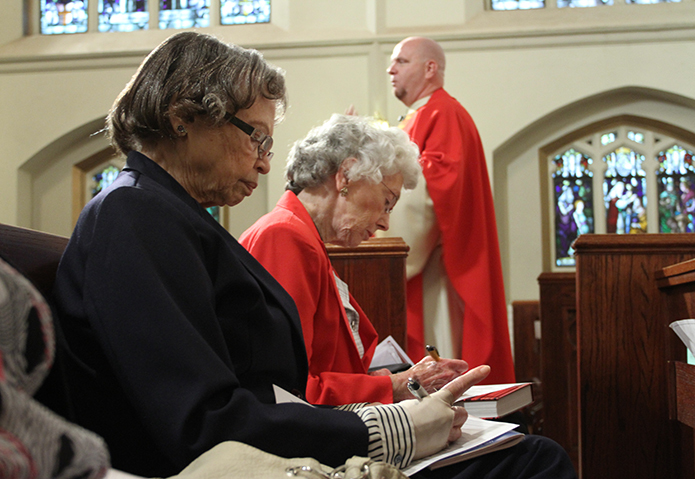 We are fortunate to have two long-time parishioners who have agreed to serve in that capacity—Louise Robinson and Dorothy Todd, from left. Louise has been a parishioner since moving to Atlanta in 1971. She has been a member of the Ladies Auxiliary and served as parish treasurer. She currently serves as a Eucharistic Minister and trains new ones as well as being active in the St. Vincent de Paul Society. Except for eight years, Dorothy Todd has been a member of St. Anthony of Padua where she was baptized in 1927. She and her husband raised and educated their children as active members of the parish. Until recently, Dorothy led the Cleaning Committee for several decades and helped build a number of houses through Habitat for Humanity. Currently she is the head of Marist Laity. Both Louise and Dorothy are supportive of the campaign to renovate the church and excited to see the campaign moving ahead. Thanks to our godmothers for helping to keep us focused on our goal to renovate our beloved church. We will be asking each parish family to make a three-year pledge to our Capital Campaign on Commitment Sunday, December 4th. This raises the question: Why do I have to make a pledge—why can’t I just make contributions from time to time during the three years? All pledges, including yours, will help determine what we can reasonably accomplish in the renovation and when we can begin. It will also be an important signal to the Archdiocese as to what they can expect from us as a community and how much they are willing to loan our parish to bridge the gap between construction and the fulfillment of pledges. The most important point, though, is that your pledge is between you and God alone. We simply ask that you make your commitment prayerfully. Between now and Commitment Sunday on December 4th, we will have time for further discussion and prayer regarding making a pledge.